Sahara mustard (Brassica tournefortii) is a short-lived, nonnative winter annual mustard that has recently been found in New Mexico. Sahara mustard is also known as wild turnip, African and Asian Mustard. It primarily invades disturbed, arid habitats and is typically found along roadsides where it has been observed to have spread 1 mile in 7 years (personal observation M Brooks); this is believed to be the primary pathway of spread. While this plant is not common in New Mexico, it has expanded rapidly in Arizona, Nevada, and California over the past decade making it a new potential threat to New Mexico. Although Sahara mustard favors sandy soils, it can readily establish in various habitats. Seeds germinate rapidly with fall and winter precipitation. 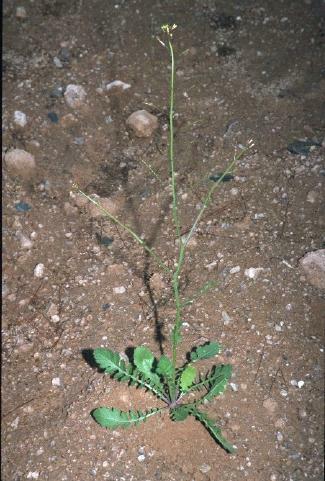 Seedlings are similar in shape and form as other annual mustards thus are difficult to differentiate. Plants quickly grow and can complete their lifecycle within several months. In New Mexico, adult plants typically are flowering from Feb – April, and senesce by May. Albuquerque and in Las Cruces in parking lots of shopping malls, residential areas, and along roadsides. Leaves form large basal rosette leaves 3-12 inches long that are deeply lobed and toothed. 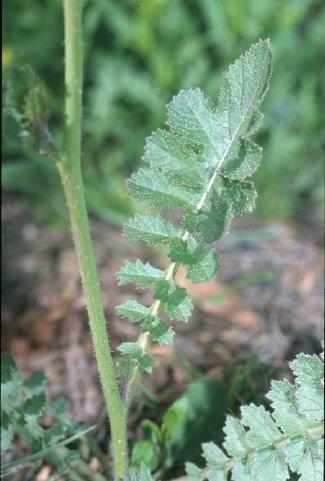 While leaves are present on inflorescences, they rapidly decrease in size and appear as small bracts. Inflorescences can vary widely in size depending upon the health of plants as they can range from 4- 40 inches in height. Inflorescences consist of racemes that can consist of anywhere from 6 to 20 flowers. Flowers are small and dull yellow, making them inconspicuous. Petals consist of two pairs, which form a cross-like shape. Petals range in size, but are generally 0.6 inches wide and 0.2-0.3 inches long and only slightly longer than the length of sepals. Fruit are specialized structures called siliques that can actively dehisce when mature. Siliques are 1.4-2.6 inches long with an obvious beak at the tip of the fruit that. Siliques contain 14-30 seeds (0.04 inches in diameter) that are red with a mucilaginous coating (Broussard et al. 2000). This plant is a winter annual that reproduces from seed from previous growth. Little is known about the biology, reproduction and spread of this species. Well developed plants produce 750-9,000 seeds, and appear to remain viable in the seed for more than 3 years (Graham et al. 2005). Seeds can readily germinate as lab tests found germination rates of multiple populations to range between 90-100% under ideal conditions. Seed germination was found to be 90 % or greater at temperatures between 61 and 82 F (Graham et al. 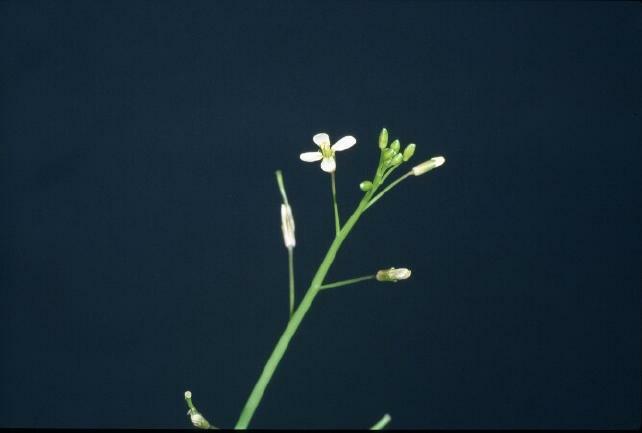 2005) and can germinated between 61-90 F (J. Holt, unpublished data). Observations suggest that seeds can germinate with as little as 1.5 inches of rainfall (Broussard et al. 2000). Seeds do not require light to germinate (Thanos et al. 1991), can tolerate saline conditions (J. Holt unpublished data), and can germinate after remaining submerged for > 10 weeks (Graham et al. 2005). Rodents cache seeds and may be capable of moving seeds over 300 feet from their source enhancing spread (Graham et al. 2005). Spread of seeds can also be transported by wind as dry plants can break off at ground level and tumble across the landscape, spreading seed into new areas. Experiments to find effective methods of Sahara mustard control are currently being conducted in the western US. Due to its annual phenology, removal or other management techniques that prevent seed production are the most effective strategies. Since this plant is not well established in New Mexico, actively eradicating new infestations is highly encouraged. This plant spreads exclusively by seed, so do not drive vehicles, move animals, or walk through infested areas, as this could enhance spread. It is hypothesized that current infestations have entered New Mexico from infested soils brought in from out of state and vehicular traffic along interstates. Intensive monitoring of disturbed areas including new construction sites where soil is imported from other areas is recommended. Hand pulling plants is effective in reducing the population, especially if done before a seed bank has established. For best results, return to the site several times a year, especially if there have been repeated rainfall events. Hand hoeing is also effective, especially if done when the plants are in early stages of growth before flowering. Mowing or other mechanical methods can be effective, but only if all leaf tissue is removed, otherwise plants may recover. It is not clear if fire will effectively reduce Sahara mustard�s seed viability, therefore its effectiveness as a management tool is not known. cover of annual or perennial grasses will likely suppress Sahara mustard germination, establishment and long-term persistence. Currently, no biological control agents for Sahara mustard exist, and it is unlikely that future research will find any as this plant is closely related to several important crops in the mustard family, such as broccoli, cauliflower, brussel sprouts, and canola. Herbicide applications may be an effective method in controlling Sahara mustard. If possible, applications should be made as spot treatments or before desirable species have begun to develop. This will minimize unwanted injury to desirable plants. If the plants have already produced fruit, plants should be hand-pulled and removed from the site as seed may be viable. Little research has been conducted on herbicide effectiveness on this species. Table 1 lists herbicides that have been documented to be effective in managing this species. Other herbicides may also be effective, but have yet to be evaluated on this species. In Australia, Sahara mustard has developed resistance to sulfonylurea herbicides which include: chlorsulfuron, imazethapyr, and flumetsulam, therefore an integrated approach should be used in managing this plant (Sindel and Brian 2000). For all herbicide applications, it is important to read the herbicide label BEFORE making any application, as different herbicides will have different requirements and restrictions. Many compounds* Glyphosate* 2 % of formulation Spot application before flowering. Apply when plants are small and before flowers and fruit are available. Many compounds* 2,4-D 1.5 % of formulation Spot application before flowering. Apply when plants are small and before flowers and fruit are available. Remedy, Garlon Triclopyr 2 % of formulation Spot application before flowering. Apply when plants are small and before flowers and fruit are available. This is a University of Nevada Cooperative Extension's fact sheet on Sahara Mustard. Bossard, C.C., J.M. Randall, and M.C. Hoshovsky, eds. 2000. Invasive Plants of California�s Wildlands. Berkeley: University of California Press, 2000. pp. 68-72. Graham, J., W.S. Johnson, and E. Powell. 2005. Identifying and Managing Sahara Mustard. University of Nevada Cooperative Extension Factsheet FS-05-02. Sindel, Brian M., ed. 2000. Australian Weed Management Systems. Maryborough: Australian Print Group, 2000. pp. 209-224. Thanos, C.A., K. Georghiou, D.J. Douma, and C.J. Marangaki. 1991. Photoinhibition of Seed Germination in Mediterranean Maritime Plants. Annals of Botany 68 (1991): 469-175.